Since last summer’s garden bounty (and maybe longer), we’ve been thinking about getting a second refrigerator to help handle produce overflow. While the garden produce technically already has two fridges (ours and my MIL’s), sometimes that is not enough, especially when we’re harvesting large amounts of bulky produce, like leafy greens. While we may well put a second fridge to good use, it just seems excessive, and, while theoretically we could unplug it when not in use (winter and early spring months? ), I imagine once we have it, we’ll find a way to use the space (e.g., storing apples), and it will be a year-round thing. Plus, while having more fridge space may somewhat alleviate the stress of Matthew returning from the garden with BUCKETS of produce, there’s still the fact that we’ll have buckets of produce to deal with — it won’t just cook or preserve itself! So, while Matthew’s been pushing for the second fridge, I’ve been dragging my heels, but knowing that it will probably happen sooner or later. This second fridge doesn’t have to be anything fancy, since it will be living in our basement. You’d think it would be easy to find something in decent used condition, at a very affordable price on CL, but that has not really been the case in our [sporadic] searching. Plus, there is the complication of getting a vehicle to haul what we find. 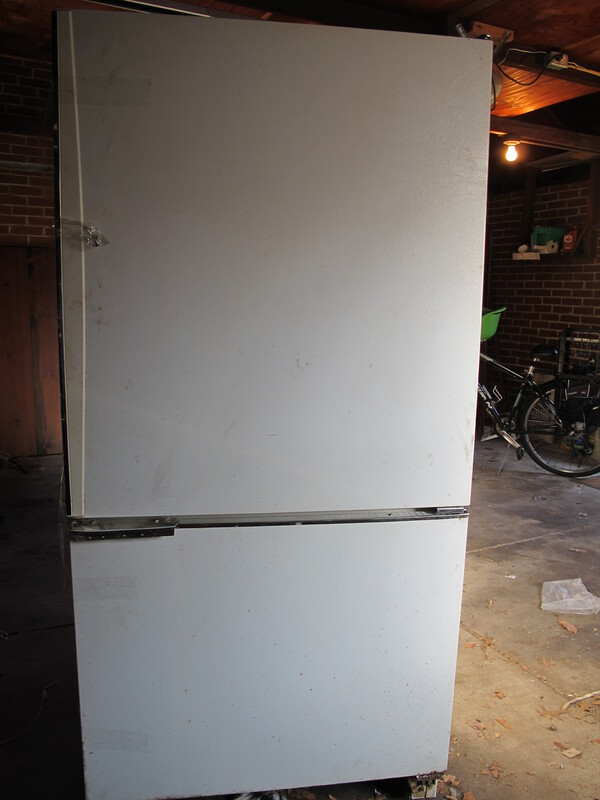 So, on Monday night, when Matthew happened to check CL and saw a posting for a working fridge for $80 located relatively nearby, he jumped at the chance, especially when the seller offered delivery that night for an extra $20. Matthew drove over to check it out, decided it was a go, and returned home to wait for the delivery. Wrangling a full-size refrigerator into our basement was hardly what I was in the mood for after nine o’clock at night, so, as a compromise measure, we decided to just stick it in the garage. Half past nine found us in our dark, rainy alley, alone with the couple selling the fridge and the truck with the fridge, along with a full-size van and two unknown males (who arrived with the sellers). Them: 4. Us: 2. Fortunately, that did not happen. You can accuse me of having a wild imagination, but Matthew was having the same thoughts. Later, we decided it would have been smarter for one of us to stay inside, where we could keep an eye on things and call the police, if necessary. Anyhow, we got the fridge in the garage and they got their cash and headed out. I’m still not thrilled that four random people now know the location of a garage full of bikes — guess I didn’t really think that through ahead of time. In retrospect, we probably could have left the garage door down, and gotten it the rest of the way in by ourselves. So, we’re now the proud (?) new owners of . . .
. . . this guy. Despite the freezer on bottom, which I thought was a relatively recent innovation, this fridge must be at least fifteen years old. Age and appearance don’t really matter, but SMELL does. Unfortunately, despite a nose that is super-sensitive to cigarette smoke, Matthew missed the fact that this fridge did NOT come from a smoke-free home (the owners were smoking outside when he arrived to look at it, so he assumed they always smoked outside, and walking through the smoke outside desensitized his nose to the third-hand smoke indoors). While you might think that something that is mostly made of metal would not really pick up odors, that is sadly not the case. Smoke is pernicious! At this point, we’re not sure we’ll keep it, but we’re very glad it’s only stinking up the garage and not the basement and apartment, as well! Some sources claim a thorough vinegar wipe-down will eliminate the smell. We’ll give that a try, but I’m not so sure, and if it still smells smoky, it’s outta here (assuming we can find a buyer)! This entry was posted in Garden, Not Green and tagged eat local, grow your own. Bookmark the permalink. 4 Responses to Expanding our produce storage? To get the smell out of the fridge and freezer I would suggest spraying it all down with white vinegar, inside and out and even as much of the compressor and motor and parts that heat up, I would see if you can get the back off and vacuum all the dust and whatever out too. I would let it sit at least overnight. Then wash everything you can inside and out and motor parts with baking soda and hot water. After it dries on the inside if you still notice a smell wad up newspaper and stuff it in the freezer and fridge, shut the doors and let sit for a couple days. You want to make sure that the parts that will be blowing the hot air either out the back or under the bottom get as clean as possible or you will have the smoke smell forever. Good luck. Thanks for the tips, Shanna! I already wiped down the inside and outside with white vinegar. Would vinegar damage the compressor and motor parts? Will try the newspaper tips, and maybe some open bowls of baking soda in there, also. We have electricity in our garage, so we plan to plug it in and run it in there for a bit, to see if that helps get the fumes out of the system.